Numenera Campaign Complete–The Dark Secret of the SubmerginesMy current Numenera campaign reached a “ending,” in that the first phase of the campaign reached an exciting conclusion. Now that the PCs are past the spoiler elements, I can write about my evil plan. Warning! 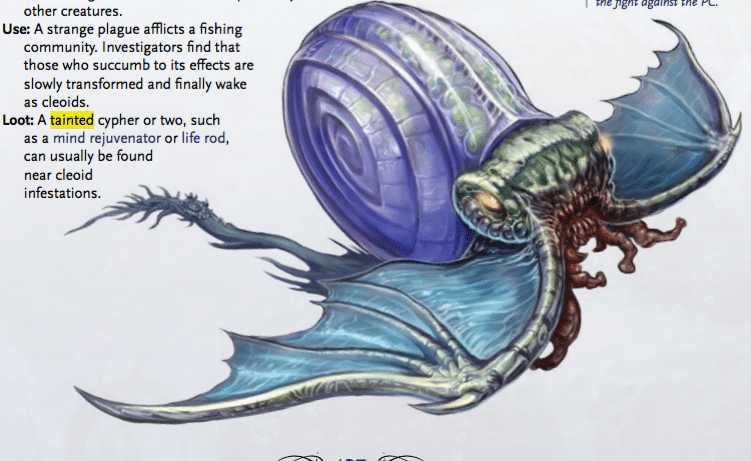 For those that have not read the “Into the Deep” supplement, there are spoilers for that supplement below. When we last left our heroes, they awoke in the drunk tank, got convicted of numerous crimes and blackmailed into investigating the mysterious, long-missing “Mergine,” inventor of the Red Fleet’s powerful “Submergine” fleet. Basically, submarines with a catchy name. Mergine alone knew the secret to build a Submergine and he disappeared 20 years earlier. Starting with a scrap a paper, the PCs follow the path of Mergine across the high seas. All the while pursued by the Red Fleet captain Bloody Bones, ruthless cannibal and survivor of 6 months alone on the ocean floor in a disabled submergine by eating his crew mates. Much adventuring followed as the party followed a thin trail of clues to the Fengali Forest, dodged Jaekels (which the players insisted on calling “Reavers”), took a Jaekal ship as a prize, found an abandoned underwater archeological dig of Mergines and, eventually, his lair. “In to the Deep” contained two ideas that I combined to make a greater whole, Mergine and his submergines and the Cleoids. Yes, all those benefits eventually change the PC into an evil, ancient intelligence bent on avenging their race’s extinction. I liked the concept of tainted cyphers “infecting” people, but it seemed to lack enough ambition and malice to really drive a plot. So I merged this element with Mergine’s story. The PCs find Mergine’s lair, where he built submergines and discovered the dark secret of the craft. While most of the vehicle is simply mechanical, the power source is a living Cleoid! At his archeological dig Mergine found “The Lith.” A device of ancient Cleoid design (looks like a pile of rocks with some tech sticking out of it) that “taints” cyphers and artifacts with Cleoid mutagenic energy. Moving it to his lair, Mergine tainted cyphers and used them on innocent victims. As they became Cleoid, Mergine encased them in a framework and inserted them into the engine of his submergines. Forever damned as living engines. The PCs found Mergine, locked in a deadly embrace with one of his victims that was secretly a mutant and struck a lethal blow with an arm spike before the transformation completed. Mergine died alone and his dark secrets died with him. Hundreds of innocent people suffered at his hands and even now suffer silently, sealed in the engines of his infernal machines. Mergine noticed that the subdued Cleoids emitted a low-level taint, much as the infected cyphers do. He included a supply of “buffer fluid” to absorb this energy in each submergine and during regular maintenance he drained the tainted fluid and replaced it with clean fluid, thereby protecting the crew from the taint. This maintenance took place every two to four years, depending on submergine use. Mergine died 20 years ago. I rather enjoyed the look on the player’s faces when that sank in. Hundred, potentially thousands of people carried Cleoid taint. The entire Red Fleet was a time bomb. This is the moment Bloody Bones walked into the scene (he followed the PCs to the hidden lair) and announced his Cleoid pride. Six months alone in a submergine pushed him further, faster along the transformation process. Battle ensued. Much psychic damage did Bloody Bones inflict and one of the PCs on his way to Cleoid failed a mental defense and became a Cleoid loyalist. More battle ensued. One of the PCs spent the entire campaign studying Mergines designs and tidbits of engineering discovered along the way. He believed he could complete a partially built submergine found in the lair…using Bloody Bones as the engine! After some great dice rolling, they pulled it off and the villain became part of the PCs new submergine. After a bit of celebrating and enjoying their new toy, a realization hit the party. They knew how to build a submergine, how to maintain them and had a brand new one ready for their use. Additionally, the entire fleet is slowly transforming into Cleoid monsters bent on genocide. So, do you tell anyone? The submergines are the most valuable ships in the Red Fleet and there is a massive incentive to make more. More submergines means more victims, a prickly ethical dilemma. Then there is the issue of the many factions that desire exclusive control of the submergines secret. Torture and kidnapping to gain exclusive access to Mergine’s secrets is likely. Cleoid sympathizers hiding in the Red Fleet ranks would learn of “The Lith” and desire to use its power to mutate more followers. So the PCs succeeded beyond their wildest dreams. Valuable secrets are theirs, and theirs alone. Now all they have to do is figure out how to use it without getting tortured and murdered by the Red Fleet, Bloody Bones crew, cleoid mutants and a good portion of all the sailors on the planet. Why Have Your Role-Playing Game Groups Disbanded?